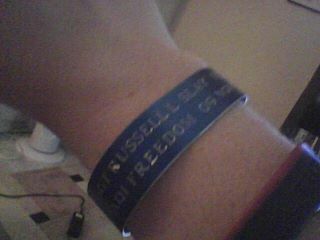 I got my Memorial Bracelet in aug 2010 for my cousin SSGT RUSSELL L SLAY TX USMC KIA IRAQI FREEDOM 09 NOV 04. I will never ever forget him and the sacrifices he made for his family & country. he was killed by a sniper in Al Anbar Fallujah on his 2nd tour. He told his family before he left that he knew he would not make it back out alive.